Purdue University: Department of Biological Sciences: Alumna Sarah Marshall Awarded "Best Clincial Research Poster"
Purdue Biology alumna Sarah Marshall received one of the awards for “Best Clinical Research Poster” at the University of Cincinnati College of Medicine’s 8th Annual Research and Service Symposium for her poster entitled “Assessment of Peripheral Blood Eosinophilia in Atopic Dermatitis”. 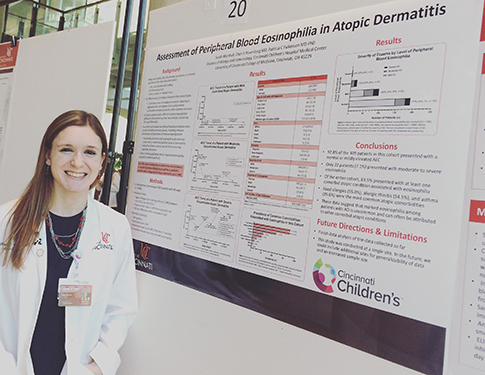 The research was completed in the Division of Allergy & Immunology at Cincinnati Children’s Hospital Medical Center this past summer. Sarah is a former student of Dr. Minchella’s research lab at Purdue.